Remember when we talked about Stockpile Syndrome, and I confessed that I had a specific Land's End cardigan in 6 different colors? Well, as much as I love that cardigan, I have apparently found one I love more. Let me introduce you to the J. Crew Jackie Cardigan. It occurred to me the other day that I had this cardigan in a few different colors. So I decided to go through my cardigan drawer and count. The photo above is what I found. EIGHT Jackie cardigans. I felt a little bit better when I realized that I've bought most of these over the span of a few years. But still. That's a lot of cardigans. However, I think there's a lot to love about this cardigan. Don't get me wrong, I still do like the Land's End cardigan, but the Jackie cardigan has wooed me with its cotton blend and 3/4 length sleeves which makes it wearable pretty much all year round. The thing that really gets me though is the range of colors. They've almost always got your standard black and grey, but then they have these yellows and oranges and pinks that aren't your standard colors, but something more, and even the clothing color-phobe in me can't resist. The cardigan second from the bottom in the photo above...the pink one? It's one of my favorites. And I don't really like pink, but that shade of pink? LOVE. Since they are J. Crew, the price tends to be a bit hefty but they do go on sale (a couple of the colors I've recently bought are now on sale). And for someone who primarily wears black and grey, it's nice to be able to throw on a cardigan to add a bit of color to what I'm wearing. 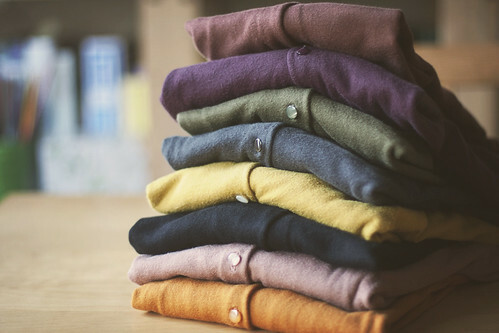 And since a cardigan is pretty much part of my daily uniform, I'm okay paying a little extra to get something I love, know will fit, and comes in a rainbow of awesome colors.